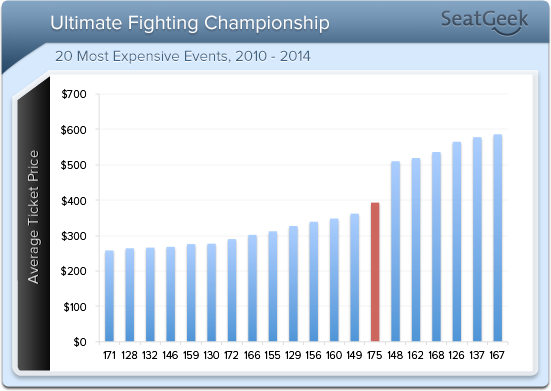 The Ultimate Fighting Championship (UFC) has morphed during its 175-event history into the kind of spectacle that many modern sports fans crave. With a multitude of fighting styles and big personalities, the athletic prowess on display on the UFC’s biggest cards each year is surpassed only by the trash talk and unbridled ambition doled out by its competitors in the build-up to the fight. The UFC itself isn’t invincible, though, with injuries to headlining stars and criticism regarding aggressive expansion tempering some of the enthusiasm for the “league’s” ever-growing annual list of shows. The promotion’s Middleweight division, however, remains one of its most dependable sources of legit hype, and that title’s defense for UFC 175 is boosting ticket sales that had been sagging for 174. UFC 175 is headlined by Chris Weidman and Lyoto Machida battling for the Middleweight title. The matchup was originally set for UFC 173 ($230) at the MGM Grand Garden Arena but was postponed for Weidman’s surgery. Weidman’s last UFC bout was part of UFC 168, also at the MGM Grand, which averaged $536 per ticket on the secondary market, the 4th-most in-demand UFC event since 2010. The headlining fight was Weidman’s defense against former champ Anderson Silva, a UFC legend who eventually broke his leg in that rematch from UFC 162. Face values for UFC 175 range from $128 for the cheapest seats to $1,298 for floor seats. The 200-level seating averages $294 on the secondary market, while the 100 level averages $611 per ticket. Floor seats have so far been traded for an average of $1,787 each. As of 3pm EST Tuesday, the cheapest seat available on the resale market is a $242 ticket in Section 215. The average price for the July 5 fight at Mandalay Bay (capacity of 12,000) is currently $393 on the secondary market, making it the 7th-most expensive UFC bout since 2010. Resale prices are up 189 percent from UFC 174, which averaged only $136 on the secondary market, and up 93 percent from UFC 170 ($204), the last fight held at Mandalay Bay. UFC 173, which also took place in Las Vegas (at the MGM Grand Garden Arena), averaged $230 on the secondary market. At its current price, UFC 175 will become the most in-demand event hosted at Mandalay Bay since UFC 137 ($578 average ticket price) on October 29, 2011. It will also be the most expensive MMA event of the year so far. The next-most expensive in 2014, UFC 172 at Baltimore Arena, averaged $290 on the secondary market, 26% cheaper than this fight.